Here is one more report about a successful radio amateur, who is using modest means, not a Big Gun type. Pavel, OK1AW is 73 years old and lives in a small town about 10 miles from the famous spa in western Czechia, called Karlovy Vary, but which was also well known as Karlsbad in the past. His station is very basic. He lives in a block of flats and the directional rotary antenna is on the roof at a considerable height. This is a mountainous area, but the horizon is clear from the roof level. This set up is ready for all modes. The microphone is used seldom, the old electronic keyer is in service more often, but in fact digital modes are the first choice nowadays. The antenna tuner is used for a Long Wire antenna suspended between buildings, with exceptional directional characteristic. Pavel moved to Karlovy Vary area long time ago. He was born, right after the WWII, in Slovakia - then the eastern part of Czechoslovakia. He became interested in radio while working in a factory in Karlovy Vary. There were many radio clubs in Czechoslovakia, at schools, factories and universities. His first call sign was OK1AWQ which was issued in 1966. His late wife Majka had the call sign OK1IWQ. They used to keep in touch through amateur radio when Pavel was sailing, before the Internet and satellite telephone era. Pavel's son is OK1DWQ and lives in Plzen. Tomas, OK1DWQ received his licence in 1977 when he was 9 years old. 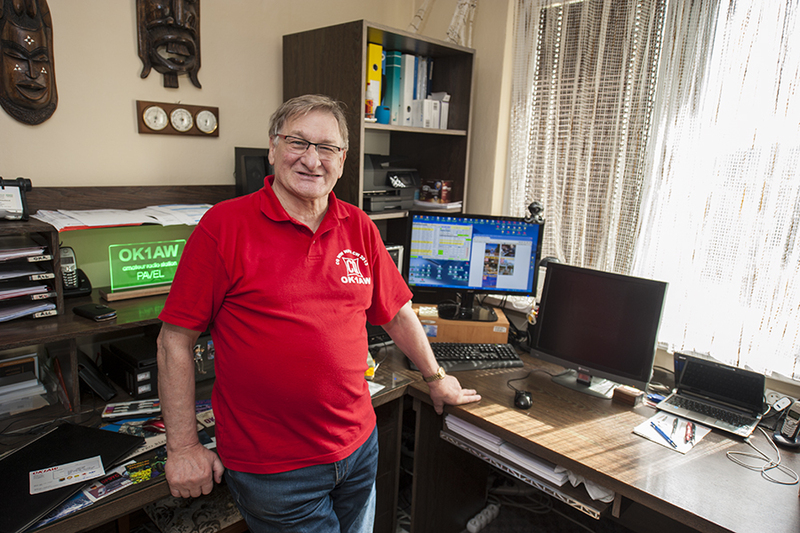 Even Pavel's brother, who lives in Slovakia, is a radio amateur with the call sign OM3CWQ. This is a true all-ham family. Pavel became a competent radio operator and for a short time was employed as in-flight radio navigator on board large passenger jet airliners. Soon, he switched to merchant navy and went to sea. During 20 years, between years 1980 and 2000, he worked as ship radio officer for different shipping companies. Neither Czechia nor Slovakia has any access to any sea, yet many radio operators, as well as other personnel, were hired from these landlocked countries to work at sea because of skills. 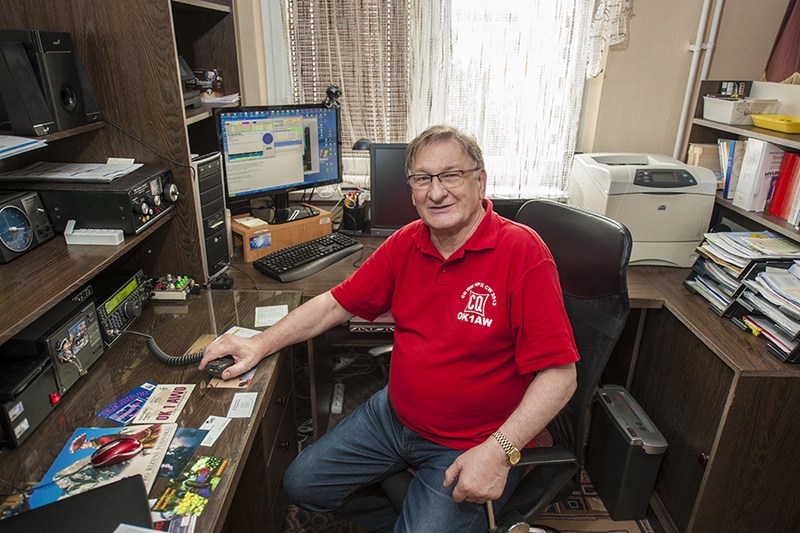 Pavel is a member of the Radio Telegraphy High Speed Club (HSC), but after 20 years as Spark, he now likes the silent digital modes and is active daily on FT8. He also participates in the activities of the European PSK Club (EPC) and the Diplom Interessen Gruppe. – This Kenwood transceiver is perfect for my needs. Excellent receiver and it has universal interface. I have had different equipment during my 50+ years of hamming. The masks on the wall are souvenirs from West Africa. There are other artefacts from different continents in his radio room. Pavel visited almost all countries that have naval harbours, during his voyages. In some places, he could meet local radio amateurs and it was always enjoyable and educating. He used the call sign OK4AWQ/MM at sea, and later OK4AW/MM. Pavel, OK1AW is a long-time member of the local club. The radio club OK1KVK in Karlovy Vary has not many members, but arranges good activities, including classes for school children. However, the town is located in a deep valley, surrounded by high ridges, so its contest site is on top of a 3500 ft /1043 m high mountain called Blatensky Vrch, about 20 miles/32 km away. The call sign used here is OL7C. The VHF/UHF and Microwave activity is actually higher than that on HF. Maybe it is because large world-wide HF contests are in winter time when snowfall makes it difficult to reach the top. 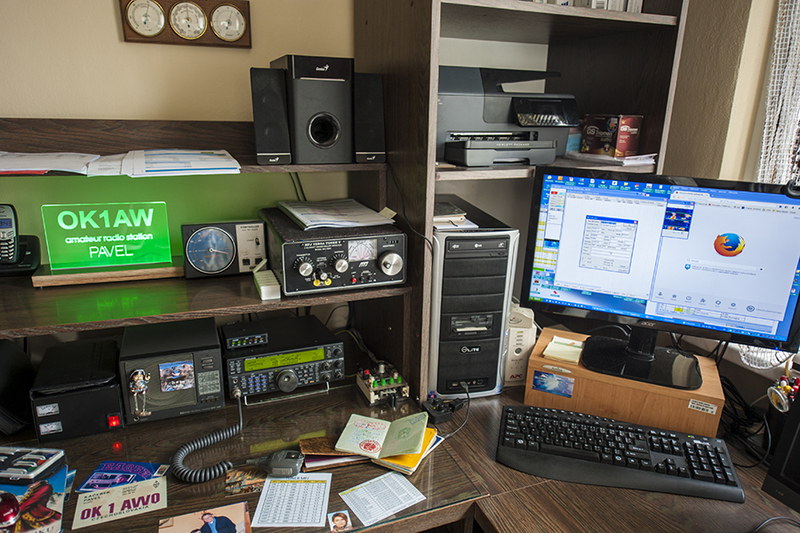 This is the main operating position for HF contests. The expensive equipment is brought here each time before an activity. This is the VHF amplifier room. 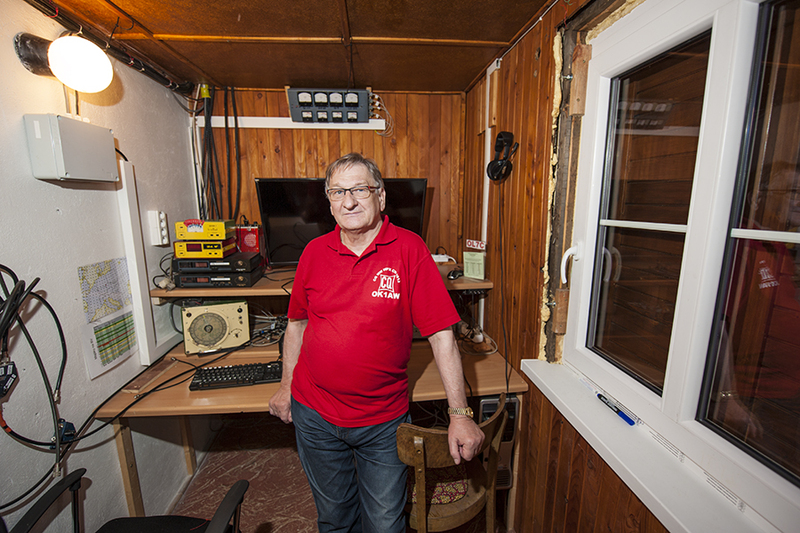 True Amateur Radio spirit; own constructions of advanced equipment and experimenting. All of it is the work of Jirka, OK1UBO. 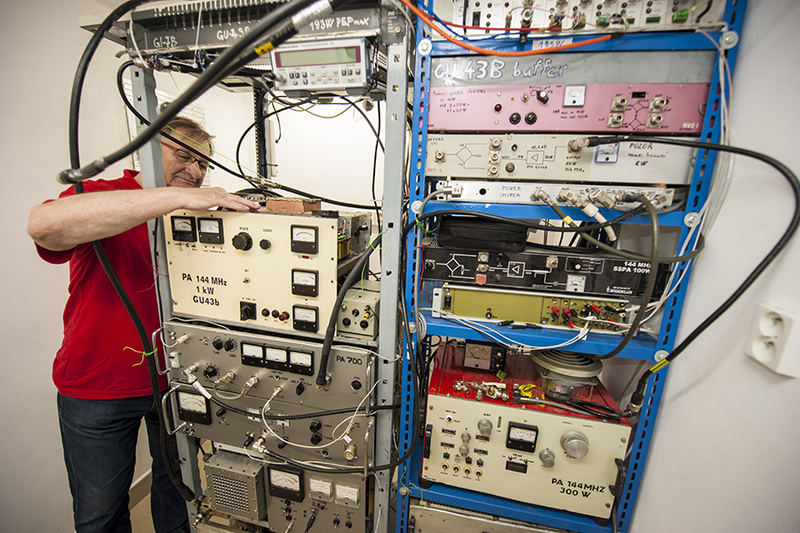 Pavel, OK1AW is looking inside the largest 144 MHz amplifier. 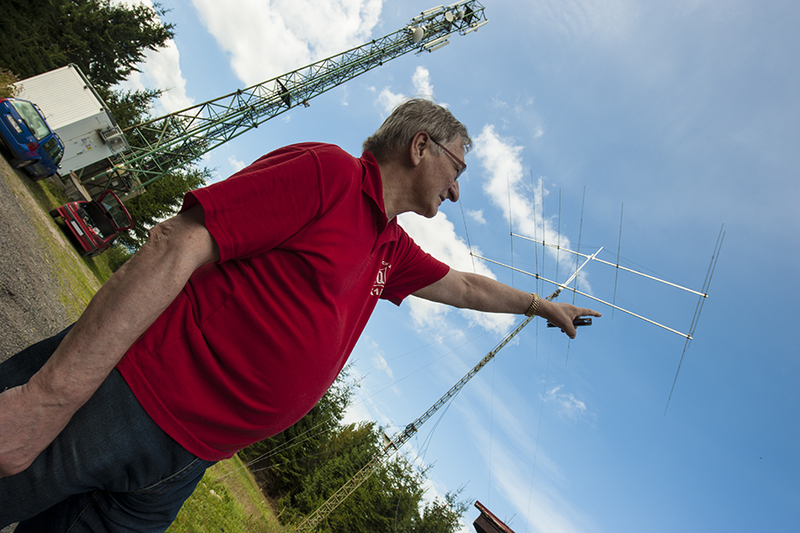 – We have to install and repair HF antennas before every contest. Springtime is better for us, as it is warmer and snow-free. But usually, all antennas need some fixing after the winter. 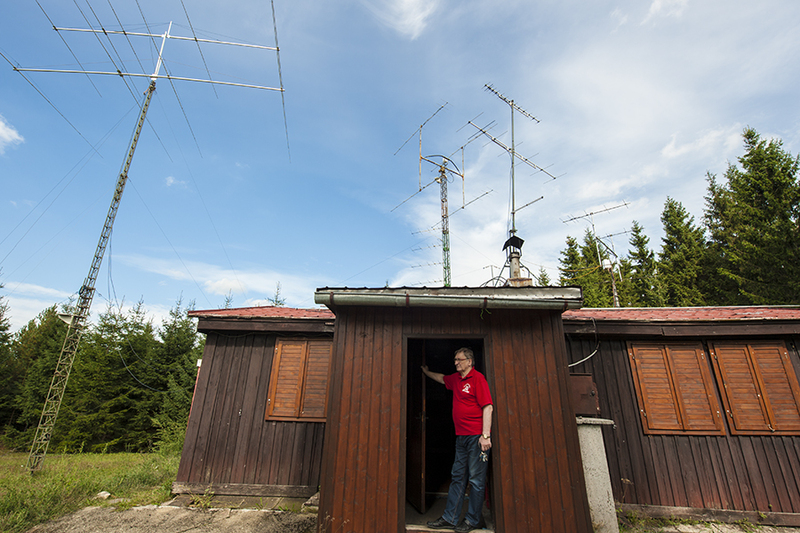 This is an example of how Amateur Radio could help to have better and more interesting life, in particular behind The Iron Curtain. I am also convinced that today this hobby can enrich one's life and be a bonus in professional or personal course of life. The reality is different now, the technology has changed, but the spirit of learning and doing things yourself is still the same. 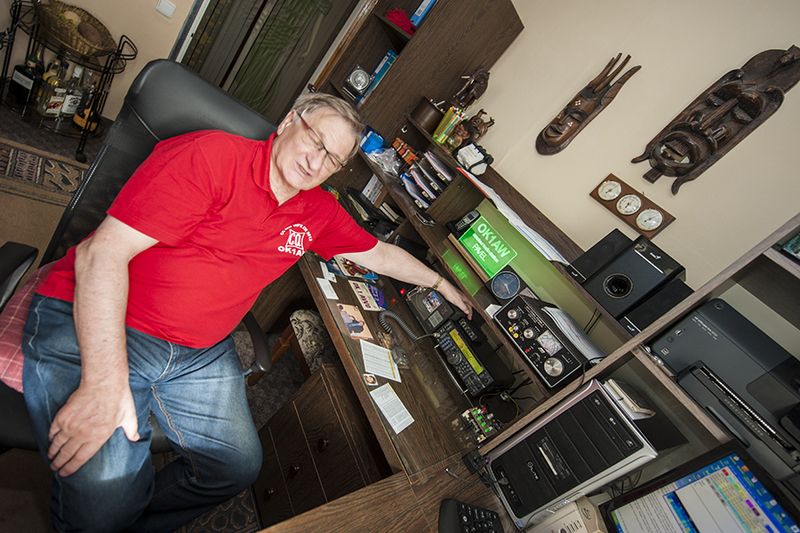 Pavel managed to get his son Tomas become interested in Amateur Radio. Tomas, OK1DWQ turned out to be very proficient in high speed telegraphy and other aspects of this hobby. I hope I will be able to meet him next time and find out how this educational pastime helped him in his life. Interesting story. My grandmother has roots in the area.